Connor Scissons (left) is the first round leader of the Junior Men's Championship. 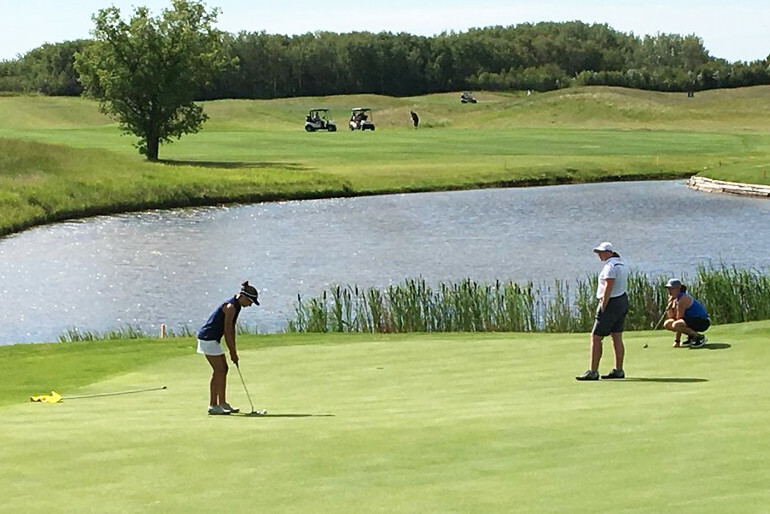 Saskatoon’s Connor Scissons carved his way to the top of the leaderboard Monday during the first round of the Saskatchewan Junior Men’s Championship at the Moon Lake Golf and Country Club. Scissons is the only player in the 54-golfer field to shoot under par during the first of three 18-hole rounds. He fired a pair of bogeys on the front nine along with one birdie to sit at one-over at the turn. Scissons ran into trouble on hole 11 carding a triple-bogey on the par five before rattling off five straight birdies to end the round at one-under par. Adam Husli of Regina is two strokes back at 73; Kindersley’s Connor Tate sits in third position at plus-3, with a 75. Five golfers are logjammed in fourth place tied at 76. The second round begins at 8 a.m. Tuesday at Moon Lake.